This is a 2 owner bike with a fresh restoration. Number 10 of the Muzzy’s built in the 1997 run. 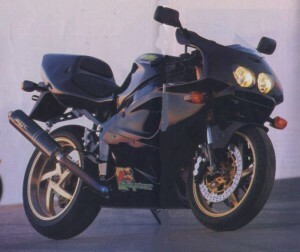 The original buyer had to purchase the stock ZX-7R from a Kawasaki Dealership. The Dealer then notifies Muzzy and sends the bike to his shop in Bend, Oregon. The stock ZX-7R is then disassembled and rebuilt from the ground up. It is made lighter, more powerful, and with better handling and control. This transformation is all done at Muzzy’s shop. The bike is then shipped back to the Dealer for delivery. Streetbike, Superbike, High Performance Street Bike. It’s all a matter of degree and detail. This specially constructed bike, the Muzzy Raptor, endeavors to be an un-compromised streetbike, built for ultimate street performance. It’s all a matter of degree…. Doug Chandler said, after riding the Raptor in testing, “This is as close to riding a Superbike that the average guy will ever be able to get’. Clearly, the Raptor is closer to Superbike than streetbike. It is a Superbike you can own. Magnesium Marchesini Wheels. These are the same wheels used on the Muzzy Kawasaki Superbikes. 41mm Keihin Flat-Sides enclosed within a Carbon Fiber Airbox. 125 Horsepower at the Rear Wheels at 12,500 rpm. Engine is a 748cc, Liqud Cooled I-4. Muzzy himself shaped the Raptor’s front faring for improved Ram-Air Inlet, Reduced Frontal Area, and to create a Distinctive Look. Says Muzzy, “The Raptor brings the ‘tuner-car’ concept to the motorcycle enthusiast. In the tradition of the Shelby Cobra, the Callaway Camaro and the Saleen Mustang, the Muzzy Raptor takes a stock Kawasaki ZX-7R and refines it to meet the desires of the most sophisticated street rider, collector or racer.” The fact that Muzzy has visited Saleen to examine that operation underscores the parallel. This Muzzy Raptor is in immaculate restored condition. Carbon Fiber Parts to reduce weight to Horsepower Ratio. Awesome! Awesome Graphics on this Muzzy Raptor.